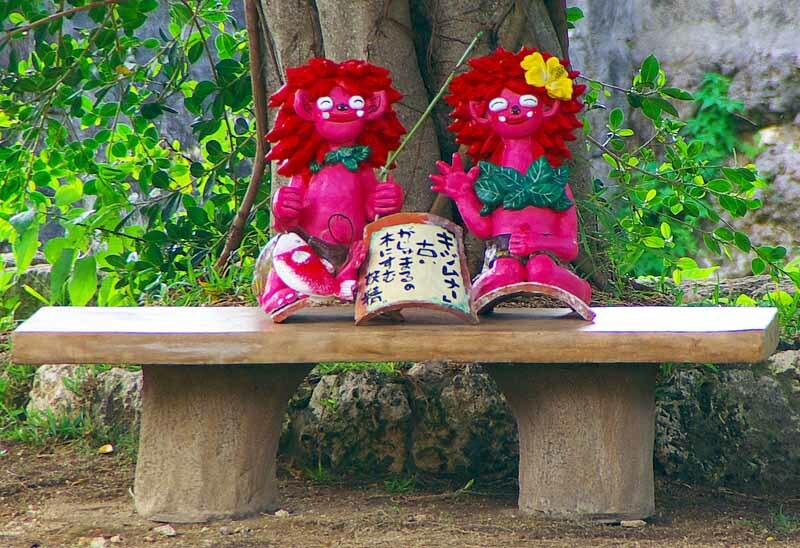 Ryukyu Life: Kijimuna Sightings in Okinawa, Japan (Photos) Be Proud ! Kijimuna Sightings in Okinawa, Japan (Photos) Be Proud ! 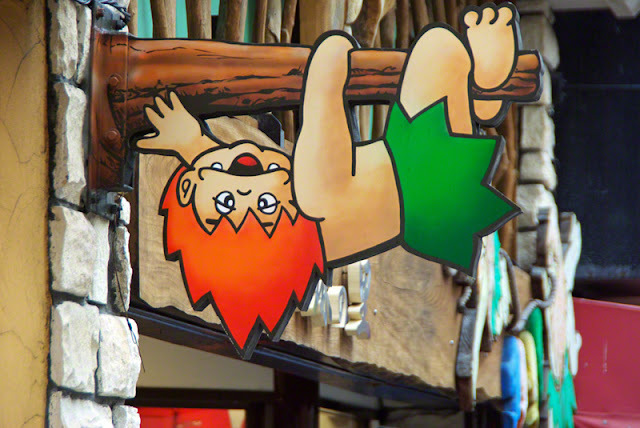 This little guy may be seen almost anywhere you go in Okinawa, Japan. He is Kijimuna. Kijimuna is a mischievous character in Okinawan folklore. He can be a friend or foe, depending on which folk tale you want to believe. There are too many versions of the story out there for me to explain here so, I'll just give you some of the generally accepted stuff. Everybody agrees the guy is a red-headed munchkin who lives in trees, loves to go fishing and is friendly. Sometimes he helps you and sometimes he causes disaster. He can bring you good luck or bad luck. 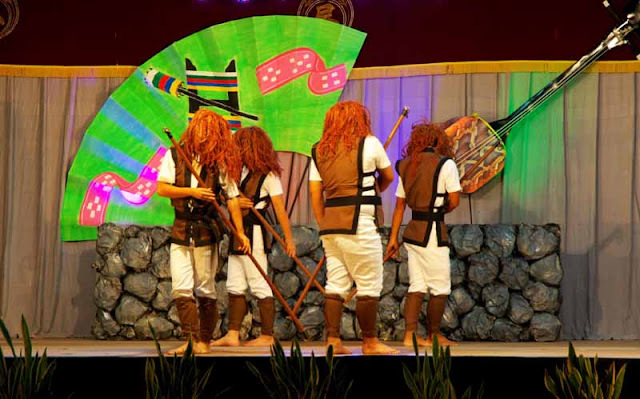 Here you see four Kijimunas (all males) performing onstage at a festival. And here we have a couple, a Mr. and Mrs. Kijimuna sitting on a park bench. Some versions of the Kijimuna story will tell you that the character helps you catch lots of fish but, he only wants the fish eyes. He takes them and lets you have the catch. There are several tales of Kijimuna bringing both good luck and bad luck to people he encounters and most of them will tell you, two things a Kijimuna hates are Octopus and Breaking Wind. Anytime you want to get rid of them, when they're being mischievous, toss one of those in their direction. There are other versions, I can't recall whether I read them somewhere, heard them while sitting around a campfire, or in one of the few barrooms I've visited over the years. The old wise men just don't write. They would disagree with the Breaking Wind theory and tell you otherwise. Call it the Okinawan Ben Franklin Kijimuna Theory, if you like. Some people believe, the proper way to greet a Kijimuna when you have a sighting is to BE PROUD AND FART LOUD. This theory has been exhaustively tested by yours truly in the field and I'm proud to announce, none of my Kijimuna sightings, anywhere in Okinawa, Japan has ever lead to bad luck, misfortune or disaster for me. Now, if you'll excuse me, I have to run home and stir a pot of beans I've been cooking for a few days. Nothing like reading about a red-headed munchkin to make me smile. Fun! Glad ya smiled. Do you know any way I can speed up my slow cooker?